This month, Wisdom Wednesdays will veer into the rise of Fundamentalism. There will be some historical exploration in addition to a closing “so what” moment at the end tying things together. Stay with the series though for the epic conclusion: Why I’m Not A Fundamentalist. The early parts of the Twentieth Century was very chaotic for religion in America. There was a rise in the hope of a scientific modern world, where the spiritual aspects of the Western world could be swept away in favor of a more logical, cerebral world. Reason was about to replace religion. These deistic understandings brought about an enlightened world, and this enlightened world came into conflict with a traditional understanding of Christianity. The resurrection of Jesus, atonement for sins, miracles, and a high view of Scripture were either dismissed outright or softened as feel good tales. Religion was sterilized in many lives and congregations. Good moral lessons were kept while the need for a crucified and risen Christ was discarded. However, this sterile view of the world was soon shattered by two world wars, concentration camps, gulags, and communist horrors. 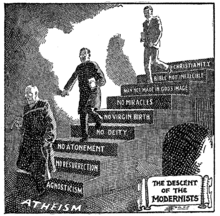 Modernist ideas caused the death and suffering of hundred of millions. Such carnage was never seen prior to the Twentieth Century, large statist governments caused the deaths of hundreds of millions in the name of progress. While America was thankfully spared a lot of the horrors of the modern age and the past century, America was a place of cultural conflict. A battle of ideas proved to be enormous for our culture. While there was scientific and historic criticism leveled at the Bible, a large bloc of the church in America defensively fortified themselves with a “radical literalism,” as Ross Douthat pointed out in his book Bad Religion: How We Became A Nation Of Heretics. This is where many Christians adopted the “six 24-hour days” in Genesis 1 as scientific explanation. This uncertain world also produced a new trend within Protestant Christianity, where the best defense of the faith was fueled with either withdrawal or reaction. It is also in this era that many took up the banners of “dispensationalism,” a new trend in Christianity. These End Times schemes were popularized in the 1910s through the use of the Scofield Reference Bible and can still be seen in the Left Behind series. As you can see, there was a lot going on in this era! These overcorrections are fascinating to me because they are pretty new. Certainly, there were views on premillennialism (not of the dispensationalist stripe, though), but this was not a litmus test for being a faithful follower of Christ. While some might have been in favor of a “6 Day creation” view, even on of the main sources of Protestant thought would caution against basing all astronomical and scientific thought on the book that was meant to reveal God, not the 2nd Law of Thermodynamics (John Calvin wrote on Genesis 1 that “he who would learn astronomy, let him go elsewhere.”). Nevertheless, a defensive fundamentalism took hold in American consciousness and this group either went to the margins of mainline Protestant churches or jumped out of these denominations to form their own (see Bad Religion, p34). Don’t despair, chaos will soon lead to some good. To be continued! Have you ever noticed that it seems like sometimes Christians might have the tendency to be overly defensive? How do you respond to attacks, real or imagined?